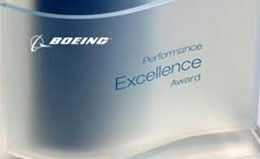 AmSafe Bridport is pleased to announce that in February it received a 2015 Boeing Performance Excellence Award. The award, issued annually, recognises suppliers who have achieved a superior performance throughout the year. AmSafe Bridport maintained a Gold composite performance rating across the 12-month performance period, from October 2014 to September 2015. AmSafe Bridport is one of only 107 suppliers to receive the Gold level of recognition. In total, Boeing recognised 530 suppliers, all achieving either a Gold or Silver award.